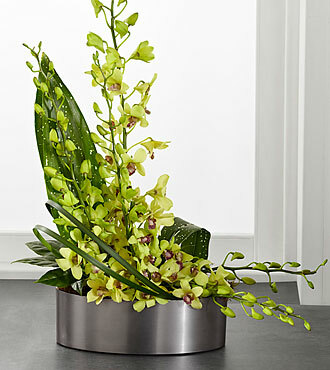 Opulent at every turn, this orchid arrangement displays floral artistry at its finest. Jade green dendrobium orchid stems showcase an abundance of pearl-like blooms arranged amongst tropical leaves and lily grass blades, on a bed of moss. Presented in a sleek graphite oval container to add to the sophistication of this bouquet, this gift of flowers is ready to create a wonderful way to celebrate with friends or co-workers in honor of any of lifes most treasured moments.